I have a confession to make. 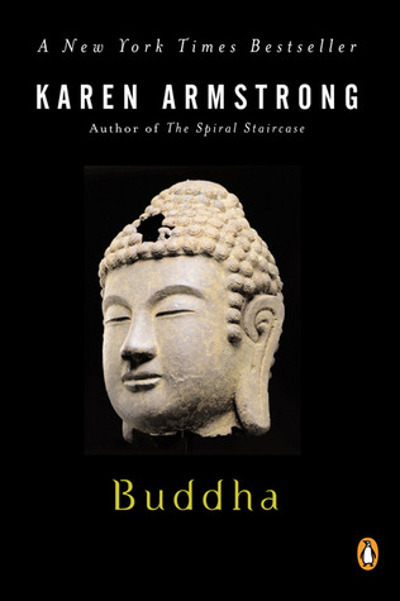 Buddha was the first book by Karen Armstrong I’ve read. I minored in religion as an undergrad, and went on to get an MA in religious studies. People have been telling me to read Karen Armstrong ever since A History of God came out. Armstrong is a former Catholic nun, a self-described “freelance monotheist” and well-known as an author of books of world religions. And now, I’m feeling kind of vindicated and no longer that guilty about not reading her books. Because I was not that impressed by her Buddha. It was, to me, “unskilled” in many ways, to use a phrase she deploys in the book. At the beginning, she sets out the challenge of how to do a biography of a person for whom there is so little historical record. The idea of taking the myths and stories and trying to tease out the commonalities into something approaching fact is an interesting one. Alas, the book was more focused on historical details of The Axial Age on one hand, and some oddly specific psychologizing of its subject, such as what he felt and why he left his wife and child. And Armstrong’s no-comment, no-sympathy treatment of the abandoned wife and child curiously dispassionate to me. Yoga: Immortality and Freedom by Mircea Eliade and have indicated that it was first published in 1936. Why does Armstrong use a scores-old source written by a white man when she might have used modern critical scholarship by practitioners? Yes, Eliade is one of the most famous figures in religious study. He’s best known for his writing on the sacred/profane, and origin myths. But along with Joseph Campbell, who Armstrong also references in her notes, I think of him as the type of superficial, outsider scholar that is included in most first-year college religion overviews, or on PBS specials, or in pop-culture. I wanted a better source, and to know whose translations of the ancient texts she was using, and why. Edited to add: I also wondered at Armstrong’s uncritical take on the caste system, presented simply as “this is what it was” rather than as the colonially constructed system posited by Nicholas Dirks in his Castes of Mind. Finally, I found Armstrong’s book dull and slow, surprising for such a short book about such a fascinating person with such a vast store of myths and legends. Frustrated and disappointed, I pulled out my freshman college copy of Hermann Hesse’s Siddhartha to compare and contrast, which I’ll write about in another post. For a more compassionate take on the book that still raises concerns, see this review at Tricycle. This entry was posted on Saturday, July 27th, 2013 at 9:07 am	and is filed under 2013 Books, Religion, Weird Things That Bother Me. You can follow any responses to this entry through the RSS 2.0 feed. Both comments and pings are currently closed. I’ve never read Karen Armstrong either, though my partner has read several of her books. He’s much more interested in religion than I am. He does like her, but has said that she tends to repeat her main thesis book to book too much for his taste and that she is more religion 101 than anything. Very much pop-culture. I think that’s fine, plenty of people need and will enjoy religion 101. I did read Siddhartha and frankly hated it. I’ll be interested to read your views though. CB, hate is a strong reaction! I’ll be interested to hear why in the comments on that one, which I’ll try to do today.